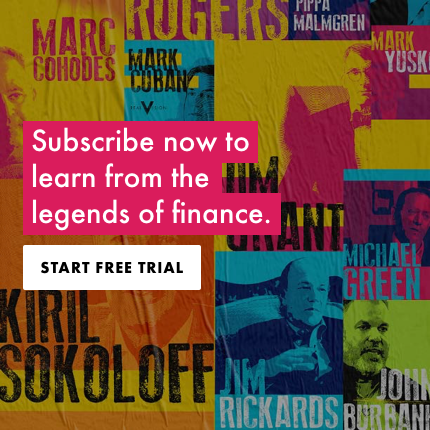 Former Bank of England Governor Mervyn King takes a seat with Jim Grant as the legendary financial writer brings the biggest names to Real Vision, with the candor to elicit the insights that you won’t see anywhere else. Mervyn King, Baron King of Lothbury, navigated the financial crisis during his decade at the helm of the UK central bank. Now he reflects on the absurdity of market models and widespread blindness as to what created the financial crisis, which impedes both the recovery and efforts to prevent another crisis in the future. Filmed on November 15, 2017 in New York. Great interview. Jim Grant is witty and knowledgable, but he should allow the guest to complete their chain of thoughts. Great interview. If you haven't read Mervyn's book, The End of Alchemy, then try and find some time to read it as it's full of very interesting information about the economy and banking. After reading Mervyn's book I couldn't help but have a very high respect for the man. There's one part in his book where he talks about QE. Which he states that centrals banks have been doing QE since the 80's and the financial commentators who thought QE started with the GFC either have short memories or they don't know their history. The end of Alchemy is a very easy to read book that's not some boring, dry, academic book on banking. It's great to see a central banker with an open mind and is man enough to admit mistakes in the banking system but also offers insightful solutions. Well done to RV and Jim for making this wonderful interview possible. Jim is masterful, most knowledgeable and I enjoy his witty sense of humour. Look forward to more with him. Mervyn King, while he does come across as humble, lets not be fooled by that and keep in mind whom he really serves. Jim did elicit good answers from him and well worth a watch. Interesting enough but how is it possible Jim didn't throw 1920/21 at him? I request Roger Ver to talk about bitcoin cash. As soon as bitcoin was brought up, King got super lively. very candid discussion with many interesting anecdotes, I wished though that Jim would have dared to venture about balance sheet netting or debt jubilee. I was really impressed by Mervyn King. Jim is a very talented interviewer but I wish he would allow the exceptional people he is interviewing answer the questions and give their insight. Mervyn King very impressive - Jim Grant rather annoying in trying too hard to display his knowledge. Jim Grant conducted the interview well but as others have suggested, Jim Grant should let his subjects answer questions lest he get the same reputation as Alex Jones who is always butting in because he wants his voice heard. Perhaps Jim Grant desperately wanted to impress Mervyn King. Real Vision has improved in leaps and bounds since its inception and it is a very worthwhile investment for information, keep it up and get even better! I was really impressed with how Mervyn King appears so down to earth. Another great interview; but Jim Grant really ought to let his interviewee finish their sentence and pause for thought. And reflect on their response. I felt that Jim was masterfully prepared for the interview. But got the impression that he needed to prove his knowledge in front of his interviewer. Nevertheless, an impressive interview! "And I see that you, sir, are fully clothed" Laughed audibly. Quip rating: 9/10. Bravo Mr King, no small feat, you are in a rare class to have turned JGs own introductory remarks back on him - my heart skipped a beat, had to rewind @ 28:43ish when JG says "I don't know that one. What's that?" seemed funny to me considering the encyclopedic reputation of Jim Grant when his opening remarks he says, "I hope to elicit from them new thoughts, and frank admissions of things they have not previously admitted to..."
for a central banker he is surprisingly humble. Ex-Central Banker. Just like Ex-Fed Chairs, they seem to find religion after they leave office. So much brilliance wrapped into one interview! I could watch this 10 times before I would find a typical "trading" interview interesting. After watching this all I have to say is buy bitcoin --- the only way this world is going to survive is through decentralization. Central Banks and big government need to go - they have given a very dangerous unstable volatile world. @ Charlie R - wouldn't it be more accurate to say other 'hard' assets, instead of 'real'? Something as non-material as a cryptocurrency seems difficult to consider as a 'real' asset. BTW, Kathleen - have you had a chance to read Erik Townsend's (Macrovoices podcast founder/ host) very thought-provoking essay on BTC, which he released late last week on the MV website? Bitcoin is neither real nor hard. It is a speculation as any good history book will tell you. Now does crypto have a place? I think so. However not in its current bubble form. "The toxic nexus between limited liability, deposit insurance and lender of last resort" is a most elegant summation of the problem, and he follows that by asking why had the US socialised its housing market. This generous interview is golden. The most elegant definition of moral hazard! Gents it seems you missed the forest from the trees -Central Banks are Quasi Govt institutions. In all these talks -what about the TRENDS OF GOVT SYSTEMS? The UK voted for “Brexit” where is it ? If Govt’s political systems are what dictate outcomes -see Cuba vs Singapore -why not ANY mention of the world trends of Socialism Vs Capitalism and the lack of the Rule of law? Your missing the point gents. Central Banks are pawns of the Black Hand ie Gov’t. What an interview! Such high educational, historical and comedic value all rolled into one. Jim Grant is one of my fav. Another fabulous RV interview. More a conversation than an interview but all the better for that. Both characters are fascinating and have amazing insights. Well done. Love love love Jim Grant and his thinking. Nice short little podcast too. Great interview... Merv is fascinating ! What a dude. Who'd have thought it. Good work Jim & RVTV. Would be great to get Mervin back again when the next crisis is underway ....... perhaps check his diary for this coming autumn. Recalling my days as a commercial banker and having to go before a "credit officer" in order to get a loan approved, King's suggestion strikes me as a return to this model, with someone at the Fed making the credit decision as to how much the Fed is willing to guarantee against the collateral banks bring before it. I only hope that the credit guru at the Fed is as tough as the person I had to face. It made me a better banker. What a great interview... Jim’s input and framing are the added sauce. Thank you all. Amazing interview! Thanks a lot Jim & Mervyn! Jim is a brilliant man. He should let his guests talk more. Bravo. Thank you for this. Simultaneously a somewhat frustrating interview to absorb and yet so revelatory on so many levels. Order of the Garter, indeed! In any case, I give it as my decided opinion that, were the truth known in no uncertain terms, we would learn that, at this point in time, given the nature and inherent volatility of the global monetary system as it presently exists, Lord Mervyn King is almost unquestionably a personal holder of a substantial quantity of what is, always has been, and will always be the only Tier One currency, and the only one worthy of ultimate trust, come what may. Real Vision: thanks for publishing this interview. Twitter lets people claim "stable genius," while your platform lets your guests demonstrate it. I remember watching Jim Grant on Louis Rukeyser’s Wall Street Week. I just loved listening to him then and the feeling is still the same. My father, now a retired lawyer, had and instilled in me a respect for the importance of words and we both delighted in the way Jim, as a panelist, would comment on the current condition of the state of economic affairs. A wonderful interview that leaves me with continued concern over the structure and incentives of our current financial regime and hope that some recognize that models are fallible. That is why no financial institutions should be able to access public markets. They should all be partnerships. Absolutely fantastic interview. This interview was so good that I ended up recommending it to a colleague of mine who moves in the circles of central bankers and central bank governors. Thank you, RVTV and Jim Grant - thoroughly enjoyed this one, and very refreshing to find central bank governors (or former ones) who are so thoughtful and incisive. Would be very interesting to see Jim Grant interview Mark Carney as well. And a very insightful point about Bitcoin / digital currencies - my read on his comments: do not invest in something you do not understand and cannot vouch for (algorithmically). And also, the current level of volatility of Bitcoin makes it a useless medium of exchange or unit of account. King was arguably the second most powerful banker in the world. His experience and commentary should be very carefully considered indeed. Have read his book, some excellent chapters, a few turgid chapters, but a clear warning that the GFC is NOT over. We are simply teeing up for GFC 2 which must occur and the implications of which will be DIRE. Is it me or did Grant just give Mervyn a piece of his mind? Grant and Raoul - in this type of interview, it would be desirable to have an overall view of the body of the interviewee. Some of us enjoy deciphering body language and, in the few shots showing his hands, Mervyn did not disappoint. Its just you Guido. I heard or saw nothing that could be construed as criticism of King. King himself has been very clear about worries approaching the crisis, learnings from the crisis and concerns on post 2009 crisis handling. Read his book. Dear Milton, I have a topic which i hope you may address soon: the Fed's massive short vix position. What does it mean really, that sell off won't be allowed (closing markets, or forbidding sales orders? ), because it would cause them a huge loss? so they have to close it now that they say they are shrinking the balance sheet? can they roll it over? can they just keep pushing the VIX down? I really don't understand the implications, because the FED and BCE wants us to believe they have our backs, but I don't think this is so, I think it is so as long as everyone believes they have our backs. Please address this question because they are destroying money management and risk management most of all. Yet another interview with a self congratulatory elite. Thank you RV for changing into incoherent mess. Really? And who exactly would you have them interview? My guess is these jobs are harder than they look (office politics amplified). I think it's only once they are out of office / have distance you can get anything approaching the truth out of them. Does anyone really think Yellen really believes her own current rhetoric? That said, she can't afford to say we / you are all fucked either as that would be widely irresponsible in terms of damage / panic done. No, I don't think they're doing a good job, but like running the country you start with a pretty bad hand to begin with. It's a bloody near impossible job, really a case of doing the least bad you can. Firstly Lord King, you partially responsible for causing the mess then you profit from a book telling everything in Economics is bulls***. All the while where we have real wage deflation, asset price appreciation which only benefits the rich. So my question is why did he implement QE? Did you actually listen to the interview? He was quite clear that QE was a necessary emergency step but not from 2010 onwards. Don't throw the baby out with the bathwater. I don't think it would have been wise to do nothing, the system could have imploded. But the abuse of QE has caused more problems than what it solves. Lord King is clear that it also send out the wrong messages / incentives as it looks as though a permanent safety net is in place. I think your criticism is harsh and I personally found this an enjoyable and thoroughly educating interview. Both gentlemen are intelligent and articulate and I feel / hope a little has rubbed off on me from watching this. I only hope RV can keep up the high bar. Excellent material. Oh wow !!! An absolute treat ! Real Vision , Real Insight , a Cut above ..
Jim Grant's intelligence is terrifying high level of knowledge with jokes. You can always tell a genius because they can act like a regular guy. Excellent interview. It is even more fun to watch this a second time. There are very subtle nuances to the facial expressions and body language that is as telling as the words they speak. Mr. King leans forward often and several times has a twinkle in his eyes that convey his delight in answering very precise and thoughtful questions. Mr. King said he would return, again a twinkle, and I for one would welcome his comments as the central bank hazard unfolds. Yes exactly. This interview IS a classic example of why we subscribe. RV with Jim Grant, have a tiger by the tail. Do not relent. It strikes me as curious that there was no acknowledgement of the role of the US Central bank's lack of enforcement of regulations which probably would have mitigated the crisis. This was the ultimate hypocracy: "the free markets work best left alone...until they don't. Great Grant and The King speaks! As for interruptions I think they each did their share. More importantly the substance and history of central bank operations was presented in a clear enough fashion so that even I could understand it. I thought it was an excellent piece. Love the interview. Would like to hear Jim less and Mervyn more. Jim loves to use his esoteric and idiosyncratic quips, cliches, etc. to prove how smart he is. We get it. Let your guest finish his answer before you begin your tirades. Is it Rants Interest Rate Observer? Jim is a VERY WELCOME antidote to endles self-serving drones in the fiancial world. Thank god somebody has a sense of humor. I think Jim felt the need to set an ireverant tone, knowing his audience would be delighted. Mervyn is used to avoiding conflict, and might have need permission to speak truth us, if not power. I would love to see Jim Grant interview Ben Bernanke...that would be something! A good interview, excellent comments by Lord King. I just wish that Jim Grant would not have interrupted so often and kept his questions somewhat shorter. That would be achieved be omitting the hundred of "em" sounds and repetitions of words. Two smart rational men in conversation is worth an infinite number of speculative economic models. But is the right audience paying attention? A full hour of intellectual modesty from two highly intelligent & accomplished individuals, either one in a position to be entirely condescending to mere financial mortals - what a wonderful rarity in today's world. I could listen for days. Well done, RV. Modesty? Did we watch the same interview? Jim Grant's constant use of esoteric phrases and pedantic tendancies—along with his frequent interruptions of his guest—were anything but modest to my mind. I still enjoyed the interview, but "modest" is one of the last words I would use to describe the interviewer. I thought his answer to 'would you buy gold' said it all. A perfect example of what's wrong in this world: Total unaccountability. This Merman comments on 2008 as if he was not bloody in charge. Excellent interview of a fascinating man about whom I did not know much. A very good use of an hour. One of the best interviews on Real Vision. Thanks, Jim Grant. I look forward to the next one. Jim Grant needs to calm down and allow his guest to FINISH his comment. So eager to hear himself speak and talk over the speaker. He’s smart I get it but don’t force it. This is why I subscribed; no fancy stuff, no music, no animations, just two smart guys in a room having a proper conversation. Jim Grant for God, or Dog, his choice. Mr. Grant sealed my love for gold when we had four former chairs in one newsie paper image above the "all is well" article. Nobody says "don't worry" unless there is an issue to worry about. Suffice to say I am betting on the inherent befuddlement and incontinence er incompetence of these overeducated bozos. A slight against clowns if there ever was one. Simply outstanding! The viewer who gave a thumbs down needs to provide an explanation, otherwise, you are a bloody idiot! I am glad the viewer has since revised his/her thumb down to a thumb up for this interview.